Summary: It’s not uber-stylish, but it feels more real than Hero or Crouching Tiger. China, 1660s. The Ming Dynasty has been overthrown by the invading Machus and the Qing Dynasty firmly established. But, as seems to always happen in China with the establishment of a new order, rebels, well, rebel, and uprisings need to be put down with force. The simplest way to achieve this is through a total ban on the study and practise of martial arts, with a bounty on the head of anyone disobeying this Imperial edict. General Fire-Wind (Sun), a former officer in the Ming Emperor’s army, sees this as an opportunity to make his fortune. With a band of mercenaries, Fire-Wind sets out to eliminate the rebels, indiscriminately claiming the reward for the heads of men, women and children as he goes. Recently, things haven’t been going that smoothly for Fire-Wind. Someone is fighting back – Fu Qingzhu (Lau), a former executioner for the Ming dynasty now turned rebel. Realising that Fire-Wind’s ultimate destination is the remote Martial village, known as a haven for rebels and fighters, he decides to protect them. He convinces two young villagers, Wu Yuanyin (Young) and Han Zhibang (Lu), to come with him to Mount Heaven, seeking help from Master Shadow-glow (Jingwu Ma), legendary martial artist and swordsmith. Master Shadow-glow agrees to help, and orders four of his disciples to return to the village with Wu, Han and Fu. He also bestows upon them legendary swords. This band of heroes are the Seven Swords: Wu, Han, Fu, Chu Zhaonan (Yen), Yang Yunchong (Lai), Mulang (Chow) and Xin Longzi (Tai). On their return to Martial Village, having repelled an advance party of Fire-Wind’s army, they decide that the safest thing is to evacuate, but this is immediately a disaster. The water has been poisoned, and the escape routes marked. There is a mole in the camp, but who? The Seven Swords must identify the traitor before Fire-Wind’s main army reach them, otherwise all will be lost. Seven Swords begins with a swift and brutal battle, beautifully choreographed. Fire-Wind’s army look great – bleached out, black armour, flags, and black and white face paint, led by a truculent young woman with a taste for blood. Fu’s arrival is heralded by the use of red and in particular his escape using an oversized Chinese lantern is visually spectacular. Sadly, nothing else in the film quite matches up to the opening sequence. Based on a novel, the film suffers from the usual problem of trying to stuff too much story into its two and a bit hour running time. 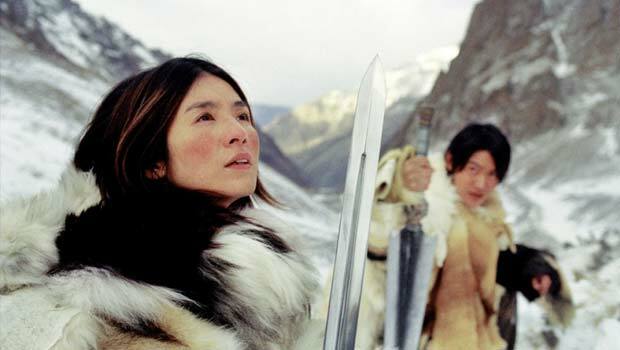 Some of the sub-plots – especially the love triangle between Chu Zhaonan, Green Pearl, Fire-Wind’s Korean mistress (Kim So-Yeun) and village schoolteacher Fang (Zhang Jingchu) are so underwritten as to be confusing and ultimately rather pointless. The film works best when it concentrates on the core storyline and could have easily pruned some of the sub-plots. There are clearly stories behind each of the swords., which have names and personalities: Unlearned, Dragon, Transience, Star-Chaser, Celestial Beam, Deity, Heaven’s Fall. The swords don’t exactly have magical powers, but they have unique properties and respond to the wearer. This is all a bit glossed over – where is the training montage? Apart from one brief scene where Yang (Transcience) teaches Wu (Heaven’s Fall) to use her sword, we don’t find out much about them. In one entirely redundant sub-plot, an ancient and powerful sword is found in the desert. But then it’s never mentioned again. Is it the sword Fire-Wind uses in the final battle? Hard to tell. What the film does well, it does very well. It’s not uber-stylish, but it feels more real than Hero or Crouching Tiger – the martial artists can run up walls but they don’t fight in quite the extravagant fashion of House of Flying Daggers. It has moments of real spectacle and, unusually for an action film, shows the human face of war as well as the cool heroics – that all this has a price.